for pain relief and restoration of function. Acupuncture is one of many techniques used within Physiotherapy for the management of pain, soft tissue injuries and as a means of enhancing the body’s own healing chemicals to aid recovery and enhance rehabilitation. It is believed that acupuncture enhances pain modulation via stimulation of the brain and spinal cord to produce natural pain relieving chemicals, such as endorphins, melatonin to promote sleep and serotonin to promote wellbeing. These chemicals assist the body’s healing process, and can be used as a precursor to other physiotherapy techniques. When do we use Acupuncture? Acupuncture is mostly known for pain relief. This is one of our treatment modalities which can be very useful to treat muscle and joint pain such as back and neck pain, pelvic pain, pregnancy related back and pelvic girdle pain, tension headaches, knee pain, shoulder pain, fibromyalgia and chronic pain conditions. 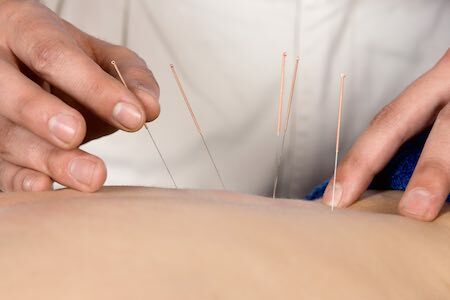 Acupuncture involves the use of single use, pre-sterilised, disposable needles of varying sizes that pierce the skin at specific acupuncture points. A number of needles may be used at each treatment and these are typically left in position for about 20-30 minutes before being removed. Acupuncture is not a pain free modality; the needle sites can produce an aching sensation and this is called ‘De qi’. The acupuncture points used will be determined by the therapist, after a thorough examination of the patient. Clinicians may use traditional acupuncture points only, trigger points or a combination of both. Patients will generally require about 3 sessions before the therapist can be certain of an effect, though some people may show immediate effects after a treatment. The effect of acupuncture is cumulative and pain relief builds up as the treatment progresses. Very safe in comparison to other modalities used in medicine. The clinic uses sterile, single use needles only so there is no risk of infection and clinicians are highly trained to follow the strictest hygiene standards. Serious side effects are very rare; less than 1 in 10,000 treatments. Dry needling uses acupuncture needles to relax muscle knots or release myofascial trigger points. It is a clean and safe technique that can alleviate myofascial pain, muscle tightness and headaches. It is a scientifically proven Western technique. A needle is inserted into a tight band of muscle which can cause brief localised discomfort with minimal side effects but is immediately effective. It works by changing the way the body senses the pain and deactivates trigger points (knots). It does this by mechanically disrupting the dysfunctional activity and stimulating healing deep within the muscle. Acupuncture is one of many services that we offer our patients and is applied as part of an overall treatment plan to manage symptoms. Your physiotherapist will often incorporate other treatment techniques, education and exercises to help with your condition.